I'm the kind of person strangers feel they can tell anything to. I base this on my experience: almost every time I enter a Wal-Mart, Target, or grocery store, some other customer will approach so they can keep me apprised of their drug problem, affair, kidney disease or crisis of faith. Other people get asked to buy Girl Scout cookies. I get told by a middle-aged man that there's an injunction against his approaching within 100 feet of Girl Scouts. But of course my friends also confide in me. I normally keep these confidences to myself. But recently I have heard the same thing from so many different people that I can safely talk about it here without revealing any secrets. Seriously, if you, one of my personal friends, think I am blogging about just you, you are wrong. I've heard the same complaints about depression, loss of faith, and weird or bad dreams, from over a dozen people in the past few weeks. And so I am using this forum to discuss the issue with all of you, plus anyone else that somehow managed not to tell me, at once. A bout of depression in a person who is generally cheerful and of good mood. The depression may extend to causing a believer to doubt the existence of God (or an atheist to doubt the validity of his or her non-belief). Weird or bad dreams, remembered even if you never remember your dreams, or normally have only happy-happy-joy-joy experiences when you close your eyes. Thing is, I am having these experiences, too. What's lucky for me is, I know what's causing them because I was warned about this time some 15 years ago; and I've been expecting the current effects to happen. 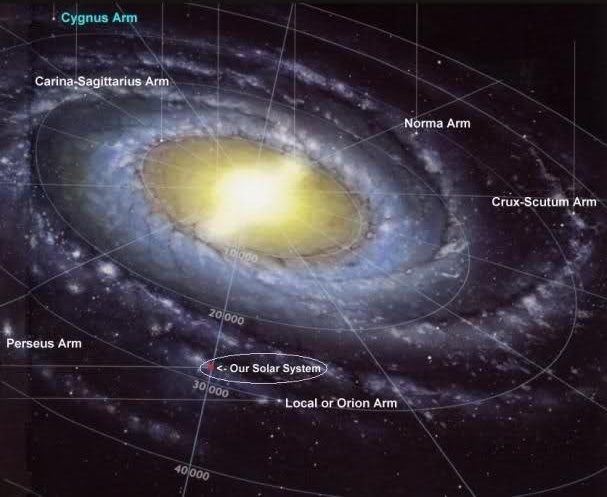 As you surely know, Earth is part of a solar system that orbits the pinwheel-shaped Milky Way Galaxy. 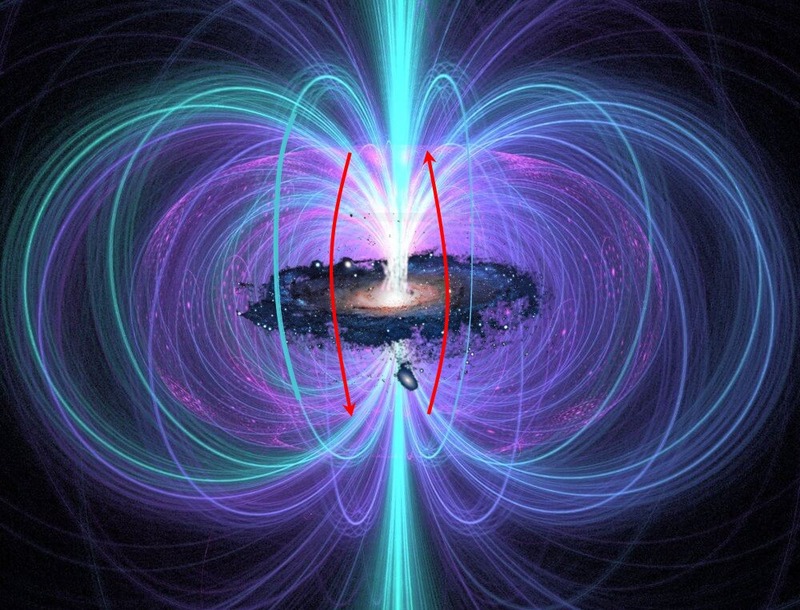 Like Earth, the Sun, and Jupiter (among other bodies), the Milky Way Galaxy has a magnetic field. Photons, which in addition to being the particles of light are the particles of magnetism, swoop in huge ellipses from the galaxy's south magnetic pole, around the entire 100,000-light-year-wide structure and collapse into the galaxy's north magnetic pole, only to repeat the journey. Many psychics in the New Age movement have, for some time now, been predicting our arrival into something called a photon belt. It began with the publication of German engineer and esotericist Paul Otto Hesse's Der jüngste Tag (English translation: The Last Day), in which he transcribes chanelled information about the photon belt. There has been a misunderstanding regarding Hesse's credentials. Some commentary on his work calls him an astronomer, which isn't true. Alcyone is the principal sun of the Pleiades, and in its orbit gravitate seven suns, our sun being the seventh which circles Alcyone. According to Weor, Alcyone has rings made of "radiation" caused by the "splitting of the electron." Weor refers to this "radiation" as "manasic" (from the Sanskrit term for the mind, manas), and indicates that "it in some way relates to [the distinction between] the inferior manas (lower mind or lower self) and the superior manas (higher mind or Higher Self)." Weor purports that "the electrons in Alcyone's rings release a type of unknown energy". Remember, the Illuminati are also capable of telepathy, and don't hesitate to broadcast disinformation. You can tell the difference by determining whether the information is full of hope, or inspires generic fear. Genuine psychic information is hopeful. Intuition, a related but distinct ability, often provides a warning, but in such cases the warning is specific and given in enough time to avoid a bad situation. As often happens, shortly after the publication of Weor's ideas, other psychics began to pick up on it. These "messages" told of an impending "three days of darkness" during which monsters would be roaming the streets and must not be allowed in no matter how plaintively they knock at the door. Clearly, this is psychic disinformation! Not only does it inspire fear and stranger-danger consciousness in the believer, but it is scientifically unsound. While Alcyone is a star in the Pleiades cluster, some 440 light-years away, the Sun, and with it the Earth, is moving away from Alcyone, not orbiting it. However, the galaxy, being composed of a far more intricate shape than a simple planet, also has a more complex magnetic field. Specifically, so I've been told by my own guides, there are twelve tori (a torus is a donut shape) extending from the galactic axis, in which the magnetic lines of force go the opposite direction. Earth and the rest of the solar system entered one of these tori somewhere around 1987. The eventual result will be the flipping of Earth's magnetic field to match that of the huge torus. That the earth's magnetic field flips direction is not unknown to science. In fact, it is well-documented. What is missing is an understanding of why it happens. The galactic tori provide a plausible explanation. In 1994, long before the newspapers spoke of "global warming", my informant told me that the switch in magnetic direction would warm the Earth's iron core just a bit, which would result in a warmer climate and increased earthquake activity. Researching afterwards, I also found that the Sun, which in that year should have born a minimum of sunspots, in fact had broken the record for sunspots identified for even a maximum year. And Jupiter's Red Spot, a storm so large it could contain two or three Earth-sized planets, showed increased activity. So I had reason to believe my source was telling the truth, and that Earth indeed had entered a belt of reversed magnetic polarity. Later, however, I began to perceive that this torus or belt had another characteristic. As you know, every material thing you see is composed of molecules, which are composed of atoms, which are composed of protons, electrons and neutrons, which are themselves composed of various quantum particles. Those particles, unimaginably small, are interesting because they behave nothing like the bigger things they comprise. Things like a car, a desk, or a banana tend to stick around for awhile—certainly more than a nanosecond. But quantum particles don't. They come and go, into and out of existence, flickering here and there yet somehow contributing to the persistence of "real" objects. It's sort of like a movie, which is composed of individual frames or still pictures. A frame is projected onto a screen or your TV set, then removed and replaced by the next frame in sequence. In between, there's nothing there! —Yet, because the process is so fast, we perceive a continual, persistent, moving picture. The earliest movies were filmed at a slow rate, approximately 12 frames per second. (It's difficult to be precise because the first movie cameras were hand cranked, and some photographers cranked faster than others.) When clockwork movie cameras were developed, the rate chosen was 16 frames per second. That was too slow for sound recording, so the sound era increased the speed further to 24 frames per second; and television further yet to 30 frames per second. One more thing: Quantum particles make up photons and empty space as well as atomic components. (Technically, a photon is a quantum particle.) 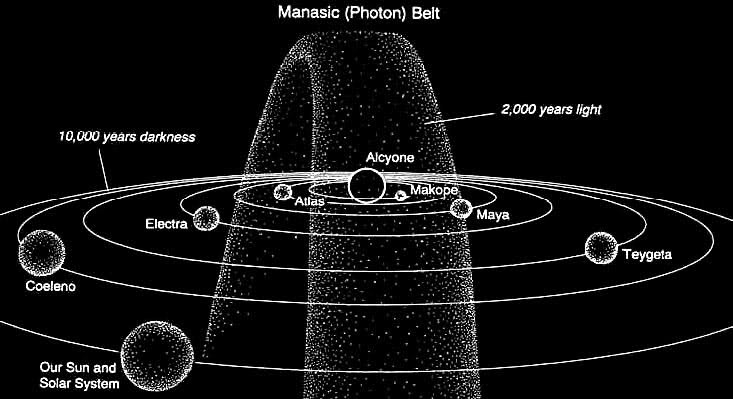 So this galactic magnetic photon belt we have recently entered, is bombarding us with ultra-high-frequency quantum particles. And these particles are raising the quantum frequency of Earth itself, and everything that lives here, including us, just as putting a can of beer in a cold river will cool the beer. In general, this is a good thing. Look around you! People who promulgated torture just a couple years ago are on the verge of being held responsible. The Republican Party membership is down to 20% of the US population—very vocal members, it's true; but still a small minority. The same is true of fundamentalist Christians, who are leaving their stultifying churches in droves. The Mormon practice of posthumously converting Jews killed in the holocaust to Mormonism (via baptism) has been exposed. Five American states have legalized marriage equality. Everywhere you look, good is finally starting to triumph after millennia of evil. However, it can be tough on Lightworkers, because the increase in Earth's quantum frequency is not smooth. Especially in the past few weeks, there have been jumps in frequency; and they affect the environment before they affect us. So there have been, and will be, days in which your personal frequency will be low by comparison to Earth's new frequency. And the result can be feelings of depression, loneliness, disconnect. And you might have dreams of explosions or poisons or insect or snake attacks. But take heart. These effects are not permanent. When they affect you, just remind yourself that this is just a sign of the good days ahead, when it's normal for people to be honest and fair, and when no one would consider putting his or her own interests ahead of those of the world in general. I think that's worth a bad dream or two. Don't you?